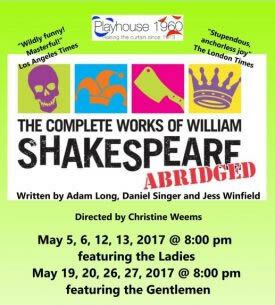 The Compleat Works works of William Shakespeare, Abridged -playhouse 1960 - Printer Friendly Page - On the Run - Theatre Port Houston - Theatre Auditions News and more! May 5-27 one all ladies, and one all gents! All 37 Plays in 97 Minutes! An irreverent, fast-paced romp through the Bard’s plays, The Complete Works of William Shakespeare (abridged) was London’s longest-running comedy having clocked a very palpable nine years in London’s West End at the Criterion Theatre! Join these madcap men and women in tights as they weave their wicked way through all of Shakespeare’s Comedies, Histories and Tragedies in one wild ride that will leave you breathless and helpless with laughter. Shakespeare may be turning in his grave, but the show that’s become a cult classic contains all 37 plays (plus sonnets) in just 97 minutes. As the comedies aren’t anywhere near as funny as the tragedies, all sixteen have been condensed into ‘Four Weddings and a Transvestite’, the history plays are transformed into a game of American football, Othello is performed in rap and Titus Androncius becomes a TV cookery programme. For the finale, Hamlet is staged first as a psychological exploration of Hamlet’s Ego and Ophelia’s Id, then performed in a matter of minutes and, for the finale, performed backwards. For lovers of Shakespeare everywhere. “What cheek! What nerve! What sheer, heavenly, unadulterated fun!” Sunday Express. Kacie Adams, Melissa Huckabay and Helen Rios will be performing the first two weekends! May 5-13 on Fridays and Saturdays at 8 PM. Nicholas Garelick, Bryan Maynard and Jonathan Moonen will perform the closing two weekends! May 19-27 on Fridays and Saturdays at 8 PM. This production is under the direction of Christine Weems and might be considered PG by some. * Event durations (if noted) are approximate. Please check with the presenting organization or venue to confirm start times and duration. This article comes from Theatre Port Houston - Theatre Auditions News and more!